Speedway Motorsports, Inc. (SMI) is a leading marketer, promoter, and sponsor of motorsports entertainment in the United States. SMI owns and operates eight premier speedway tracks across the country, with each track hosting some of the world’s largest events including NASCAR, IndyCar, NHRA, World of Outlaws and other motor racing series. For more than six decades SMI has improved and modernized its race properties to stay at the forefront of the motorsports industry. It has a robust history of innovation and always seeks to enhance the race experience for fans, sponsors, team owners, drivers and media. Each SMI property operated independently, with different sales strategies and best practices. SMI wanted an easier way to consolidate the massive scale of fan data available from operating eight world-class venues, so it sought a technology platform that could aggregate its data into distinct, enriched fan profiles that could be understood and accessed by everyone within the organization. The platform would need to provide the tools to effectively track SMI’s sales efforts so it could gain visibility into best practices across all of its venues. SMI desired to pair this technology platform with a robust, customizable mobile app that could deliver innovative content, capture fan behavior and preferences and enhance the race experience for all of its fans. SMI wanted to help ticketholders easily find what they loved at each venue by providing mobile access to maps, schedules, interactive media, ticketing information, breaking news and more. At the same time, SMI wanted the app to collect user data it could analyze to more fully understand what fans desire and how the organization could enhance its exceptional race experience. The solutions to these challenges would help SMI grow by leveraging each venue’s strengths and best practices to ultimately retain its loyal, passionate fanbase (while also attracting the next generation of racing fans). Ahead of the 2015 race season, SMI chose FanThreeSixty as its technology partner, citing FanThreeSixty’s proven success with sports organizations and its commitment to customizing and tailoring the solution to meet SMI’s unique business challenges. SMI wanted its fan data consolidated into Dimension—the FanThreeSixty cloud-based tool for sales management and fan engagement—since Dimension is designed specifically for sports organizations and provides powerful, lean functionality engineered perfectly for the industry (without all the excess of standard CRMs). SMI and FanThreeSixty engineers customized Dimension to fit SMI’s data needs and imported millions of ticketing profiles into the platform, appending them with historical notes, survey results, and mobile and demographic data. Once the siloed data was organized into distinct fan profiles within Dimension, SMI immediately gained better visibility of its fanbase—everyone in the organization could now access fan profiles and historical data in a central location and could leverage Dimension’s user-friendly interface to make powerful queries and segmentations of those fans. FanThreeSixty launched new mobile apps for each of the eight tracks, all customized around Uphoria—FanThreeSixty’s fully configurable mobile app solution. Each track’s Uphoria app gave fans instant access to ticketing information, maps, schedules, interactive media and a host of other tools that helped them locate amenities within the venue. The apps also allowed SMI’s marketing and digital teams to reach out to fans in real time with information about a favorite driver appearance, a ticket offer based on purchase history or other content that could assist fans as they experienced the venue during a busy race weekend. The Uphoria apps paired seamlessly with the Dimension platform and captured data about fan preferences and behaviors, meaning Uphoria not only delivered engaging, relevant content to race fans’ smartphones—it also helped SMI gain invaluable insights about fan ticketing and purchase behaviors at the same time. Each race event presents opportunities to identify new fans and augment SMI’s understanding of existing fans. As new fan data is captured from each of the eight tracks, SMI has the ability to append ticket purchase history, buying behaviors, gender, birthdate information and other demographic details to the enriched profiles stored in Dimension – previously there was no way for SMI to assign these new data points to a particular fan. Today, SMI not only augments existing information about its fans, it also continually identifies new fans. In the two years since partnering with FanThreeSixty, its number of unique fan profiles has increased by 35 percent. SMI now uses Dimension to track the entire sales process. In just eight months sales teams have logged 250,000 fan touchpoints and streamlined over 150 sales programs in Dimension, deepening insights about fans and centralizing overall sales efforts into a single platform. Dimension’s customizable workflows allow SMI to craft strategies specific to each audience it wants to target. For example, SMI has determined that first-time ticket buyers have very different behaviors and preferences than repeat buyers. It uses this insight to tailor specific sales pitches for each group and increase chances for conversion. Additionally, because all activity is archived in Dimension and not subject to associate turnover, SMI can analyze the outcomes of past programs to assess their overall effectiveness and retarget fans in future campaigns. Because all eight venues are using the Dimension platform, SMI is able to better identify success indicators and share these best practices and insights across all of its tracks. For example, Texas Motor Speedway implemented an upsell program targeting first-time ticket buyers. After integrating its data into Dimension, TMS used the platform to automate the upsell program and streamline the entire sales process—Dimension automatically flagged new ticket buyers, allowing the SMI sales reps to focus their time on presenting upgrade packages to these new fans. After seeing the strength of the TMS upsell program in Dimension, SMI shared the automated program with its seven other venues and maximized the impact of its success. In addition to sharing best practices, SMI uses Dimension to get better visibility of new opportunities for cross-marketing. This promotes better communication between each venue, and, since major races occur on just a handful of weekends each year, it provides an invaluable opportunity to ensure that SMI fans everywhere are made aware of all local events relevant to them. Each track uses its Uphoria app to bolster an already awesome race experience. 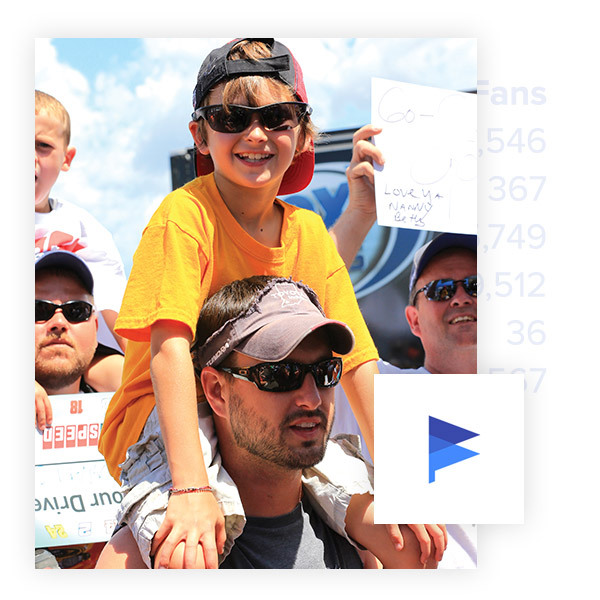 Not only do the apps deliver fully customizable race content, they allow SMI to reach out to fans instantly and educate them on how best to experience the venue—examples include how to purchase a pit pass, where roadtrippers can park and camp on race weekends, and how fans can redeem exclusive sponsorship offers. Whether fans are attending in person or watching at home on the couch, Uphoria allows SMI to forge meaningful relationships with its smartphone users by enhancing the race experience at every point throughout the fan journey. 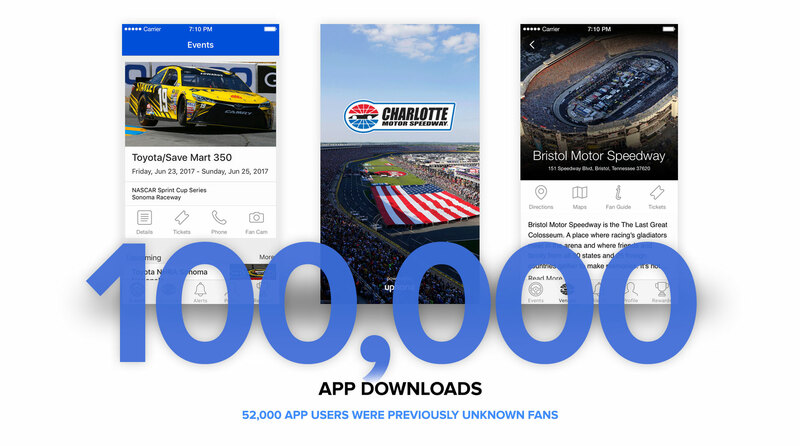 Due to Uphoria’s delivery of essential race content and SMI’s commitment to improving the fan experience, the apps surpassed 100,000 downloads in just eighteen months after the launch. More than half of these downloads were from previously unknown fans. SMI turned these unknown fans into new leads by learning their ticketing, brand and social media preferences, then engaged them with personalized content, experiences and sponsorship offers. It found that among all first-time ticket buyers, renewal rates for the following year’s event were 12 percent higher if the fan had the Uphoria mobile app. SMI has found that partnering with FanThreeSixty provides a competitive edge for its organization. Dimension equips SMI with the user-friendly and powerful sales management tools needed to tap into its fanbase. Uphoria delivers an enhanced race experience for every fan and allows SMI to increase fan exposure to personalized ticket promotions and targeted sponsorship offers. With each race weekend comes a windfall of new data that further enriches SMI’s understanding of its fanbase—the process of deepening relationships and engaging the next generation of racing fans has really just begun. SMI will continue to build on its culture of innovation in the coming years, using FanThreeSixty to further refine its sales approaches and increase revenues. On the horizon are new data strategies that will anticipate and predict fan behavior and help further automate time-consuming pain points of the sales process. Transform the way you act on your data.